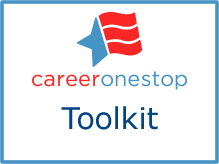 You can learn details about different careers, connect to training and resources to prepare for your next job, or start your job search right away, using the free online tools in CareerOneStop’s Toolkit. mySkills myFuture: Wondering what other jobs you could do with the work experience you have? Find careers that relate to your current or previous job, and learn about education needed, demand, typical wages and more. If you’re ready, you’ll even find job listings to apply for, in your local area. Military to Civilian Occupation Translator: Looking for civilian career fields that relate to your military work experience and training? Use this translator to find related careers, and their typical duties, salaries, and job outlook. Skills Profiler: Need to better understand what your skills are, and the careers that match them? This tool provides both, and generates a list of tasks related to any career you enter. Job Finder: Looking for job openings in your local area? The Job Finder provides postings from 3 different national job banks, updated daily. Postings link directly to job applications or contact information. Veterans Job Finder: Ready to put your military experience to work? Find job postings across the U.S. that relate to your military job title, skills, and training. Business Finder: Ready to reach out to employers before they post jobs? Use the Business Finder to target businesses that may be hiring in your field. Interest Assessment: What careers best match your interests? This quick 30-question assessment takes less than five minutes to complete and shows you a list of careers that might be a great fit for you. From there, learn more about careers: whether they’re in demand, how much they pay, how much school you might need, and what you might do in a typical day. Occupation Profile: Need to know how much you could earn, training needed, tasks on the job, employer demand, and other details about a career? Data on nearly 900 occupations available. Tools & Technology Finder: What machines, equipment, tools, and software do workers use in different occupations? And if you have experience using specific tools or technology, you can find out which other careers employ them. License Finder: Does a career require a license in your state? Or in any of the 50 states? Find out, and get contact information for state agencies that oversee licensing to learn more. Salary Finder: How much do different occupations pay? Find local, state, and national median wages for any of nearly 900 occupations. Local Training Finder: Where are the schools and training programs in your area? Find the best fit for you. Certification Finder: Which professional certifications are available in your field? How can you earn them? Also learn which certifications are in highest demand by employers. Professional Association Finder: Professional associations help their members keep up-to-date on trends in their field, get certifications, and provide excellent networks for job searching. Want to find one in your field? Scholarship Finder: Need financial assistance for higher education? Search more than 7,500 scholarships and other financial aid awards. Search by closest deadline, keywords, locations, and more. Apprenticeship Finder: Want to train on-the-job for a skilled job, and earn wages as you do? Locate an apprenticeship field office in your state for contacts to help you get started. Resume Guide: Time to pull a resume together, or update your current one? Create the right resume for your situation using tips from the Resume Guide, and learn how to market your resume and yourself. Local Help: Wish you had local services to help in your job search? You will find your closest American Job Centers, and other workforce services in your neighborhood and across the country. ‹ Did you know it’s National Apprenticeship Week?